There are 4 posts tagged dravid. Fun as a way of doing Business, and why the “Cricky says Thanks” Campaign? 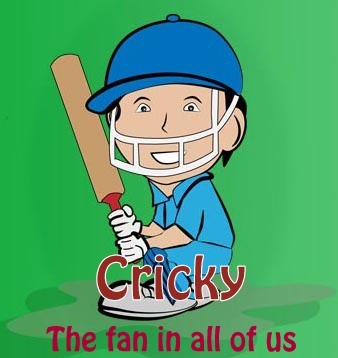 As I (CricketRadius) launch the Cricky says Thanks to Dravid and Ganguly campaign on twitter today, I want to take you into a brief journey of how I came up with the idea and how I see fun as an integral part of life, whether it is doing business or watching a game of cricket, or anything else for that matter. If there is one mantra I live my life by, it would be this. The focus is not on breaking rules, but on having fun. We learn by doing, and by failing we learn how not to fail the next time. But that failing had all the fun. Remember the childhood days when you fell off the bicycle, or while playing football, and how much fun it was. And with every fall, we became better at not falling. For me, doing something the way I want do it is the greatest thrill in the world. I have always been in the business of cricket. Irrespective of where I have worked, I have always followed every single cricket match played by India in the last 20 years. I have devoted hours every day reading articles, watching videos and discussing about cricket with my friends and colleagues. The point I am making is what you ‘care‘ about is your business anyway, in whichever form it is. And throwing yourself into a job you love and enjoy is one of life’s greatest pleasures. The one thing that wakes me up in the morning these days is the idea of giving a great experience to my customer. I have myself followed cricket by way of keeping a track of records in notebooks and cutting pictures from newspapers to form huge albums of collages. Later on I have maintained excel sheets containing all kinds of cricket related data and kept them updated regularly. What I am trying to do with CricketRadius is to deliver a product for myself and people like me. I have still not figured out what the end product would be, but I am sure I know it somewhere deep inside and just have to bring it out in the right form. If I have an idea that can save the planet, I will act on it. But if I have a small idea which will just make watching cricket more fun, I will work on that too. For me, the real joy is of ‘creating‘ something new, not in how big or small, and the journey in itself rather than the destination. So the point is – Just make a difference where you can. Some solutions can be scaled up, some can’t, but I like to realize that after taking action, rather than in classrooms and meetings. How the campaign came about? It is not a co-incidence that the campaign is about expressing gratitude to Dravid and Ganguly for their contribution to Indian Cricket. I have spent my childhood watching their entire careers and I believe these two players have had the biggest impact on Indian Cricket in the last 20 years, along with Anil Kumble, VVS Laxman and Sachin Tendulkar. And in todays inter-connected world, the question I am asking with this campaign is – “What if twitter had been there on these 5 historic matches which I am re-creating and reliving?” Every fan has the option to relive those moments of pure joy by following the commentary, reading articles and watching videos about the same online for 5 days starting today. And what better way to show that we acknowledge Dravid’s and Ganguly’s contribution to Indian Cricket than getting all fans together in the form of a huge collage made out of our Twitter profile pictures – The Twit-Bat. So follow the matches live on our twitter account, and invite other fans to take part in the campaign all details of which can be found here. 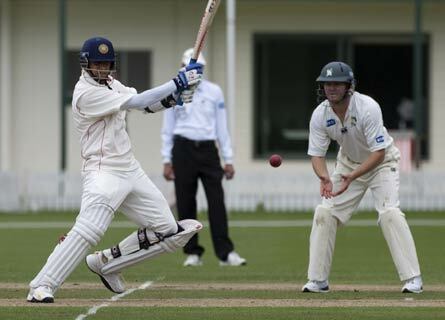 If there are sports as fast as hockey and football which can get pretty exhaustive and a real test of stamina for players as they hardly get any break in a game, there sits Test Cricket on the other side where your stamina and skills are tested, but in a totally different way. Test Cricket is the longest form of cricket, where two teams play over five days, and sometimes even those five days fails to produce a result. Nevertheless, it has its own following and has been in existence since 1877. It puts the players’ skills, patience, fitness and stamina to utmost test over the five days. Waiting is a very important part of test cricket. Waiting everyday for a 40 minute lunch and a 20 minute tea forms an integral part of the day. Apart from that, there is more waiting, for the openers to settle in, for the ball to get old, and then waiting for 80 overs to take the new ball. The batsman wait for the ball to stop swinging, while the spinners wait for the ball to start spinning. The bowlers wait for the batsmen to make a mistake, and the batsmen wait with their shots till the bowlers are tired. A test match can turn a match over its head many times over the period of 5 days. Every session gives both teams the chance to show their talent and come back into the game. This way it is a real test of skills and only the best team will win at the end. Lucky performances don’t matter as much as in ODI and T20 cricket. There is ample proof of this as teams have won after having to follow on or being completely outplayed in the first innings. No other sport perhaps can give such thrills. Test cricket, more than anything else, is the test of patience of the players. Ishant Sharma’s spell to Ponting in Perth in 2008 was a testimony for that. A bowler has to bowl long spells and really bring out his talents to the table to get the batsman out. There is no hurry or run rate issues and the batsman will not play any rash shots. The batsman will also wait for the bowlers to get tired out and the ball to get old before playing their shots. In this way, it is more about playing time and testing the patience of the opposition which makes Test Cricket so intriguing to watch. Although it might seem like a slow game, it never goes down in intensity. The concentration and focus which players need to put in, and the fighting spirit which brings out the best in many players, is a real treat to watch. Players like Rahul Dravid, Steve Waugh, VVS Laxman, Anil Kumble are a result of this unwavering focus and never ending determination on the cricket field. Playing continuously for five days, sometimes under very harsh weather (like in Chennai) requires great level of fitness and character to survive, let alone play. Many of the players to score a century in Chennai have suffered cramps and dehydration, but it has also brought out some of the best innings and test matches ever played. When a bowler has to bowl 40 overs a day and a batsman might need to bat out more than 10 hours, every muscle in your body will be tested and is a big challenge for not only the players, but also the support staff. Those who say Test Cricket is dead perhaps have never realized what cricket is. The contest between bat and ball, the constant struggle to wait before the other side makes a mistake, and the never ending twists and turns it brings, with the emotions it brings out from players as well as spectators, make it the ideal ‘Test’ of a player’s skills, and also their patience. Only test cricket can create great records such as Australia’s 16 consecutive test wins, and only test cricket can bring out matches like the Calcutta Test in 2001, or the Adelaide Test of 2003, or Headingley in 2002. Only test cricket can bring out heroes like Gavaskar, Dravid, Laxman, and Kumble. And cricket would certainly be poorer without the presence of players of this stature. Australia had their best team ever in 2001 under Steve Waugh. They had won the previous 16 test matches on a trot, including the 1st test against India at Mumbai. The 2nd test match was to begin on 11 Mar at the Eden Park, Kolkata and Steve Waugh was finally going to conquer the final frontier. Australia batted first and started in trademark fashion, reaching 193/1 at tea in 53 overs. But a very young Harbhajan Singh had other plans. After tea, his deliveries were like bombs for the Australians. Ponting, Gilchrist and Warne fell in successive balls, giving Bhajji a hat-trick and Australia slid to 291/8 at the end of play. India would have thought (and wanted) to get them out early 2nd way, but Steve Waugh, the captain was still batting with Jason Gillespie. India’s hopes faded out soon, as Waugh got to his century and Australia to 400. He kept full confidence in Gillespie and McGrath and rotated strike with them, unlike other players who try to take full strike with tail enders. The partnership of 133 for the 9th wicket and 43 runs for the last wicket showed the world his confidence in his men. Australia finally finished at 445 with Bhajji taking 7. India started in trademark fashion, losing their first wicket with no run on the scorecard. Those days Dravid was an opener who did not open in most of the matches he played. The conquering Australians had McGrath, Gillespie and Warne and India’s score of 128/8 at the end of day 2’s play was no surprise. Australia were looking at their 17th straight win and a test series win in India after some three decades. On day 3, India folded out of 171, and as expected, Australia imposed the follow on, unaware of what awaited them. India finished day 3 at 254/4, still 20 runs behind Australia’s first innings total and their last recognized pair at the crease. 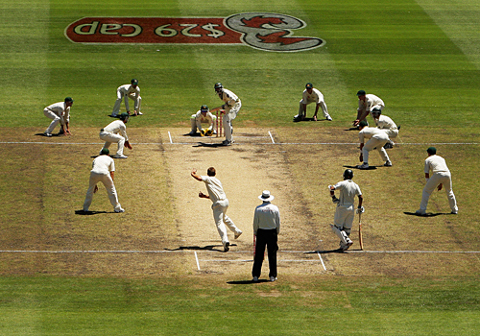 March 14, 2001 would be the longest day in test cricket for Australia. For, India finished day 4 at 589/4. 90 overs, 0 wickets, 335 runs. Well, the last recognized pair of India have batted the whole day. Laxman made the highest individual score by an Indian going past Gavaskar’s 236. 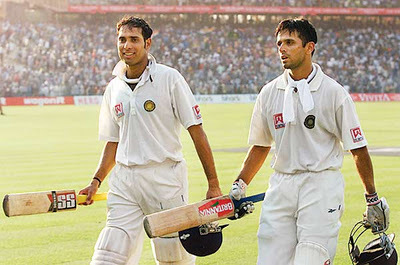 Dravid gave him able company at the other end. Both played some exquisite shots all round the park that day, and even McGrath and Warne were seen helpless. 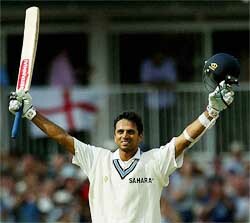 Laxman’s wristy strokes and Dravid’s class eroded Australia’s pride in that one day like a desert storm. Atleast India would get a draw now, the whole country was hoping. On day 5, Ganguly declared India’s second innings at 657/7, giving Australia a target of 384 runs. Whole India and the cricket experts thought why did not he just bat till draw was the only outcome possible. But the south paw had other plans, he was thinking of winning the test match after following-on. Only 2 times have that happened before in the history of test cricket, and guess what, Australia have lost against England both the times. Some 75,000 people have turned up at the Eden Gardens on the final day to watch history being made. At tea, Australia were 161/3 in 43 overs, will all 3 results still possible. After tea, Harbhajan removed Waugh and Ponting in quick succession. The score read 166/5. Enter Tendulkar, with his off breaks, leg breaks and the occasional seam delivery. 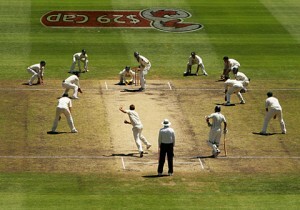 Gilchrist, Hayden and Warne just could not figure out what was happening, with all three falling lbw to Tendulkar. The score now read 174/8. Bhajji completed the formalities and Australia folded out of 212, handing India a victory by 171 runs. Bhajji’s 13 wickets in the match (including a hat-trick), Laxman’s 281 and Dravid’s 180 in a partnership of 376 runs for the 5th wicket, and Tendulkar’s 3 wickets in the final session, all played their part in triggering the Australian collapse when they lost 7 wickets for 46 runs. Whole of Kolkata and India was celebrating like they have won the world cup. And Steve Waugh was given a high voltage shock by the Indian Team led by Ganguly. They went on to lost the final match in Chennai and the final frontier remained unconquered for Australia and Steve Waugh.